As soon as you enter the brave new world of parenthood, you’ll be bombarded by products that promise to keep your little one safe and healthy. Plenty of those goods get an A for greenwashing and an F for their actual ingredients, but Beautycounter is one brand that proudly and transparently sports their green cred. A couple years ago, the brand launched their non-toxic bath collection for kids. Now it’s baby’s turn with three hardworking products that keep baby’s skin clean and protected with pure ingredients. With the philosophy that basic is best, Beautycounter unveiled a baby oil, a body and hair wash, and a daily protective balm, with ingredients that are effective yet minimal. Trust us: you and baby won’t miss out on the unnecessary fragrances, toxins, and questionable and controversial (and often hidden) components that make ingredient lists as long as your arm. Babies’ skin can run the gamut from dry and flaky to oily and acne-ridden, and many little ones are super sensitive to new products. 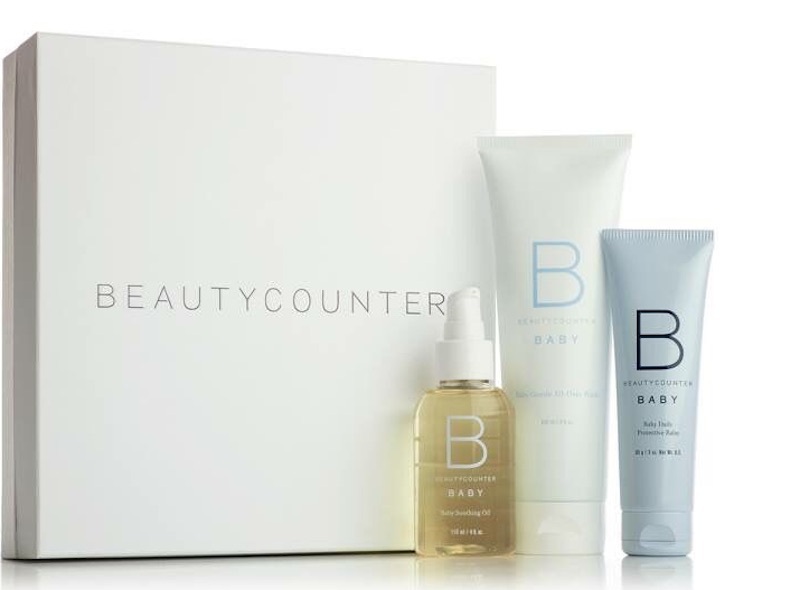 Beautycounter keeps their formulations simple: the nourishing, fragrance-free Baby Soothing Oil has only four ingredients: organic sunflower, coconut, and jojoba seed oils and tocopherol. The tear-free formulated Baby Gentle All-Over Wash can be used for hair and body, meaning one less product crowding your bathroom. Organic shea, sunflower seed, and jojoba oil are foundational ingredients for the Baby Daily Protective Balm, which helps provide a protective barrier for skin. Moms and dads are encouraged to spread on a layer of this soothing balm as well. Want to cover all your new baby needs? Grab the deluxe gift set, which includes all three products. The company operates with a strict Never List of more than 1,500 ingredients that will simply not be included in Beautycounter products. As we have unfortunately learned, the U.S. government is way behind when it comes to regulating and banning substances that go into our everyday products. Beautycounter has strict ingredient standards, screening all its potential ingredients and working with scientists to stay up to date on the latest innovations and discoveries regarding ingredients. Additionally, Beautycounter goes beyond the call of duty by offering an abbreviated list of commonly used chemicals to keep handy while you are shopping. About 80% of Beautycounter ingredients are organic or plant-derived — the other 20% are synthetic but carefully regulated and tested. The new products, which all earned the Environmental Working Group’s admirable rating of 1, come in containers that are recyclable too! As soon as you enter the brave new world of parenthood, you'll be bombarded by products that promise to keep your little one safe and healthy. Plenty of those goods get an A for greenwashing and an F for their actual ingredients, but Beautycounter is one brand that proudly and transparently sports their green cred. A couple years ago, the brand launched their non-toxic bath collection for kids. Now it's baby's turn with three hardworking products that keep baby's skin clean and protected with pure ingredients. With the philosophy that basic is best, Beautycounter unveiled a baby oil, a body and hair wash, and a daily protective balm, with ingredients that are effective yet minimal. Trust us: you and baby won't miss out on the unnecessary fragrances, toxins, and questionable and controversial (and often hidden) components that make ingredient lists as long as your arm.